GALVESTON, Texas -- Hundreds of sea turtles have been affected by cold weather in Texas. CBS News affiliate KHOU-TV reports National Oceanic and Atmospheric Administration (NOAA) workers have rescued 50 sea turtles so far. An additional 200 are expected to arrive to the NOAA's Galveston lab Friday, where they will be weighed, measured and later released back into the ocean. Experts say sea turtles that become stunned by cold weather float to the surface because they're too cold to swim. 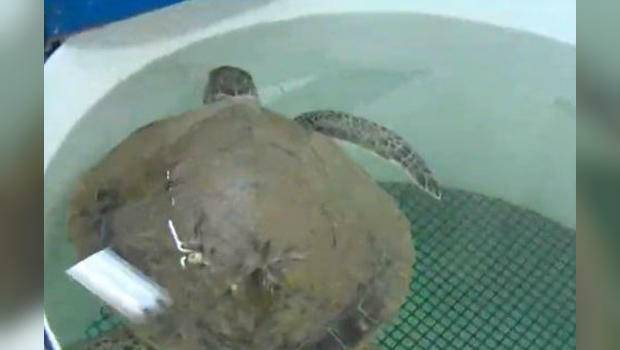 A cold-stunned sea turtle may become "dehydrated because they've been floating on the surface for a few days," Ben Higgins, sea turtle program manager, told KHOU-TV. "We are the ones that push these animals to the brink of extinction, so we have an obligation to at least step in and help (and) try and restore their numbers," Higgins said. Sea turtles, however, are not the only species that has been affected by cold weather. In Florida, it's so cold that iguanas have been falling from their perches in trees. Several residents have photographed the reptiles lying belly up on the ground.